I have so many backlog posts to upload. However, spurred by Wendy's little challenge, I decided to go for this instead first. With just 3 ingredients - milk, ginger and sugar, how tough can a ginger milk curd be? Sometimes it's the simple stuff that is hardest to make. I was deeply humbled. I knew it was going to be tough since Wendy is a way way experienced chef than moi but I didn't know it was going to be THAT tough. After 5 tries, my ginger milk only mildly curdle. I have read quite a bit of tips online before I started. 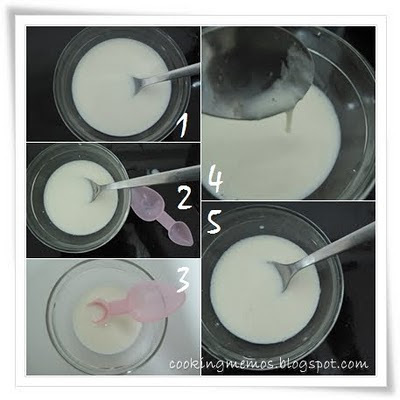 Tips include: full cream milk, pouring milk onto ginger, using cold ginger i.e. from fridge, obtaining the right temperature, ratio of ginger juice to milk etc. All didn't helped me much. Test 4 Boil & rest for 10 sec 1 9 Failed. Mild curd. 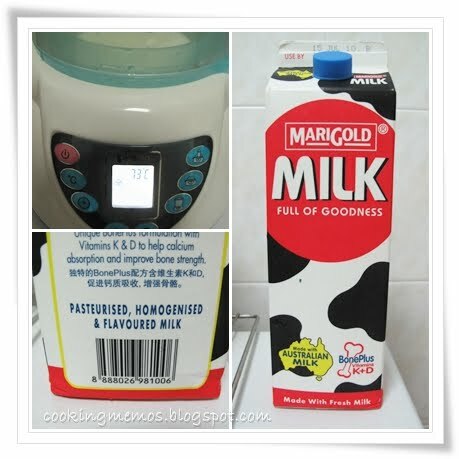 Milk used as shown below. I even use my baby's food warmer to ensure I got the RIGHT temperature. Hehe. For the record, milk content is Fat 3.6g/100ml and Protein 3.1g/100ml. Test results as shown below. Notice my portion gets smaller and smaller? Well, apparently Hubby didn't really like the ginger milk taste. So I have to reduce the portions to ensure he has enough milk for his breakfast. Hmmm... maybe using old ginger will do the trick? Wait.. you didn't use old ginger???? You must use matured ginger, if not it won't work. Plus, 73C is not enough.You have to take into account the heat absorption by the setting bowl and the heat loss while pouring, so 85 should be it.You must pour in one flow cos you need that gushing power to combine with milk with ginger juice w/o stirring. You can't stir it once the milk is in, cos you'll disturb the curds. Maybe you'd like to try with a non homogenized milk. and they didn't use homogenized milk. Yah cos some website say it doesn't matter so I simply used the ginger I have which is the young one. :( I guess I have to wait till this milk runs out before I am allowed to buy new ones. Hehe. Will update again.